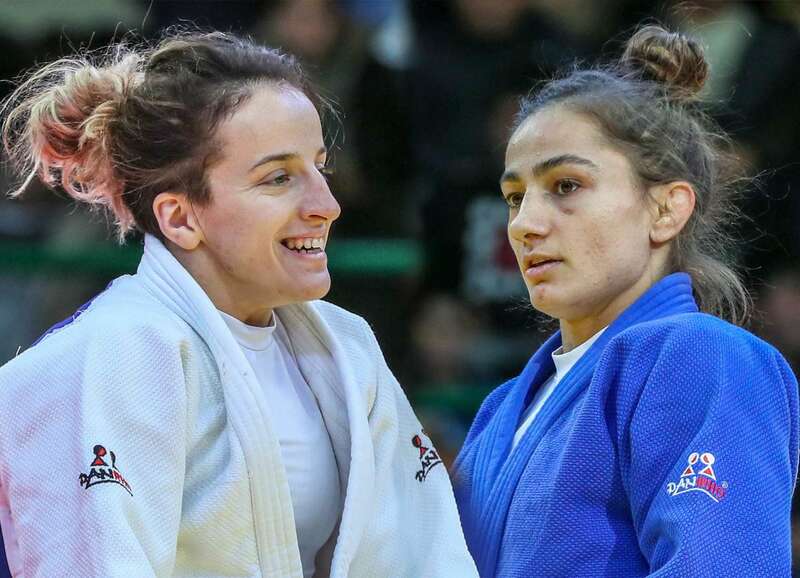 It is a fact that Kosovo, in the space of just a few years, has become a major player on the world judo scene, especially thanks to Majlinda Kelmendi, two-time world champion and Olympic champion in Rio, the first in her country's history. However, this happens infrequently enough to be underlined three times: during this first day of competition in Tashkent, it is not one, nor two, but three Kosovar athletes who entered the final, leaving no chance to the contenders. This overall performance is exceptional and somewhat reminiscent of the success of the Cuban women's team a few years ago, when the group led by Ronaldo Veitia, who entered the IJF Hall of Fame last summer, were winning medals non-stop. There are probably some similarities between Cuba and today's Kosovo: a desire increased by the sometimes difficult living conditions and the desire to offer a better life through sport. It must be emphasized that Majlinda Kelmendi, despite or thanks to her Olympic title, continues to have the same desire to win. Injured and absent from the IJF circuit for over a year before returning last month in Abu Dhabi, she returned to her best level at the right time while the Olympic qualifying is in full swing. What is even more extraordinary is that, in her absence, she has succeeded in motivating a whole generation of athletes, most of whom living in the same street, and who are now reaching maturity on the world circuit. This is the case for Distria KRASNIQI, in -48kg and Nora GJAKOVA, in -57kg. If the two young women are, by necessity, still in the impressive shadow of their eldest, they start to shine more and more. Technically at their best, they are above all strong in their head, each match being taken as a vital objective, and whose outcome can only be victory. This mental strength is their asset and they know how to use it wonderfully. Majlinda won today. We could say, again. But watching her big smile at the end of the final clearly shows that she was the happiest woman on the mat at that particular moment. She knows what she already achieved and she knows more than anybody else what she went through. Today's victory had clearly a special taste. Imitating Kelmendi, KRASNIQI also won the gold and Kosovo was close the the hat trick as GJAKOVA only lost in the final. We have not finished to talk about Kosovo and what has become obvious: its school of judo, this machine to build champions on the tatami, but also in life. Among the men, the Uzbek public, which came in large numbers in the early hours of the competition, was expecting a lot of their local champions and it was not disappointed. Thus Diyorbek UROZBOEV, who declared during the draw that his team was very strong, proved that he was part of the world judo elite by reaching the final. Unfortunately he couldn't win and let the opportunist GANBAT Boldbaatar won a well deserved gold medal. UROZBOEV who set the tone for Uzbekistan was imitated by his compatriot Sardor NURILLAEV who also entered the final in the upper category (-66kg) to guarantee a second medal for the host country (they actually won a third medal with Shakhram AKHADOV. But the result was the same as the victory went to Adrian GOMBOC - SLO. The Technical Analysis by Alexander Jatskevich First of all I must say that I am really pleased with what I saw today. We have seen really dynamic judo, with many scores. Generally speaking the trend is that athletes are less and less trying to win with tactics, I mean to be clear with shidos (penalties). They are trying, at least trying to score and that is very positive for our sport. I am sure that in the future this trend will increase even more. The competitors have understood that to win they need to step on the mat, with the desire to score. Of course, it can happen that you win with penalties, but it's a totally different mindset to go on the tatami wanting to score. During the preliminary rounds we had really a few disqualifications and I think there was only one case of hansoku-make given to an athlete for applying a dangerous technique (standing waki gatame). Of course, we can and we must underline the overall performance of Kosovo. They are impressive athletes under the leadership of an amazing coach (Driton Kuka), who is capable of motivating the team like nobody else. It is obvious that having a star such as Majlinda Kelmendi in the team helps a lot. She is strong, but not only that. She is the perfect example for her teammates, and should be for other judoka as well. It is clear that she inspires the rest of the team. In the final block, when we see that we had 15 matches and that all together it took less than two hours, this is a sign that the quality of the judo was at the rendezvous. Of course it was not perfect all through the final block, and we could see that some of the athletes were waiting for the golden score as soon as they were getting closer to the end of the bout. But then, they were taking all risks to score quickly and that is what happened every time. We really had a successful day and I hope people enjoyed the judo as much as I did. Alexander Jatskevich of Latvia started judo when he was 12 in 1970. He is a member of the IJF refereeing commission. In 1980 he obtained a bronze medal at the Moscow Olympic Games. He was also a Junior World Champion and three times European Champion. Later he became a successful coach, especially with the Belgium team from 1989 to 2005. 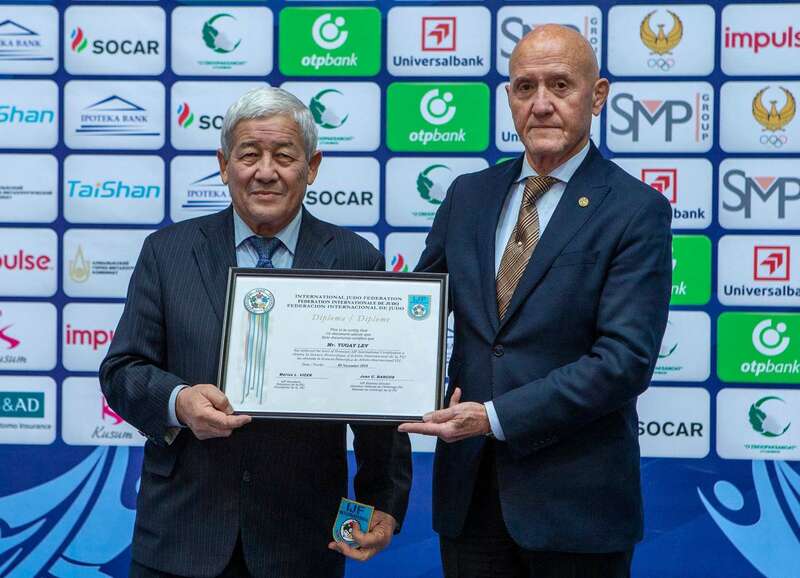 Just before the final block, Jan Snijders, IJF Head Refereeing Director, presented the Honorary Refereeing Certificate to Lev YUGAY (UZB) for his commitment to the development of judo in Uzbekistan and for having refereed more than 40 international judo events. During the break between the preliminary rounds and the final block the numerous public also had the chance to discover a nice judo demonstration performed by young Uzbek judoka. The young children received a present for their performance.